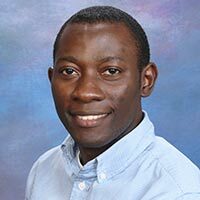 Julius Adewopo is a Postdoctoral Fellow and Geospatial Analyst for Maize-based Systems. Prior to joining IITA, he has acquired multidisciplinary experience in natural sciences, geospatial applications, and corporate management. He earned his PhD in Soil Science from the University of Florida (UF) and M.Sc. in Forest Resources from the University of Arkansas-Monticello, both in the USA. He obtained a bachelor’s degree in Forestry and Wood Technology from the Federal University of Technology, Akure, Nigeria. His PhD research focused on the impact of management intensification on soil carbon dynamics and underlines important ramifications for long-term ecological sustainability, especially in subtropical grasslands. He is an ESRI-certified Spatial Analyst and was a recipient of the prestigious UF Graduate Fellowship and USDA-Sustainable Agriculture Research and Education grant during his doctoral studies. Julius has served as focal point and coordinated side events at high-level UN processes such as UNFCCC-COP16 at Cancun, UN Forum on Forests (UNFF) 8th and 9th session at Manhattan (NY), and UNFF Major Group Meeting at Ghana. In 2013, he led a team of scientists and students (enlisted from different universities across the U.S.) in an unprecedented initiative to identify top priority research questions for soil science in the 21st century. He is currently serving as an appointed Member on the Governing Council of Commonwealth Forestry Association, and has served as staff research performance reviewer for Smithsonian Tropical Research Institute (STRI). His outstanding accomplishments have earned him numerous recognitions including award for excellence from the International Union of Forestry Research Organization (IUFRO), induction into the Gamma Sigma Delta Agriculture Honor Society, and top presentation awards at international conferences. He is currently leading geospatial aspects of a Bill & Melinda Gates-funded project to address yield gap in Nigerian maize-production systems. He collaborates with colleagues from other institutions for overall project implementation in other target geographies (mainly Tanzania and Ethiopia).